Heading a Formula 1 team means an immense pressure on a team principal, especially if this team is Ferrari, the most famous squad of autosport history. 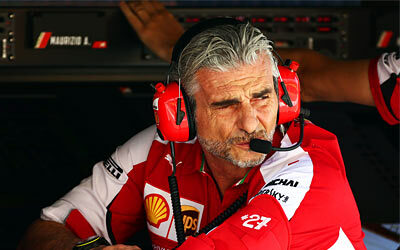 Maurizio Arrivabene took over the regime in the sunset of last year. The flamboyant Italian conceded the task of leading the glorious scarlet team is „eleven out of ten” on the difficulty scale. Every single move which Ferrari takes is scrutineered by the fans and the press and many want to create big stories from meaningless happenings. In Barcelona Ferrari wanted to test both the all-new package and the mixture of the old-spec and the new components. "Kimi (Raikkonen) said ’I want the old one’, but then I heard in the media that we had tossed a coin to decide. Everything we do is many times greater than it is in reality. "Once, I went to the bathroom and everyone was asking ’Why is Maurizio in such a hurry?’"
Arrivabene was very happy with how the year has gone so far, but he also feels the pressure which the suprising Malaysian GP win put on the shoulders of the team. "In Barcelona we were 45 seconds behind, but last season the gap was one minute and 27 seconds. "After (winning in) Malaysia, I thought to myself ’This is too early’. Because people would expect that now we go for the world championship. But this year we have the goal of winning three races, and four would be fantastic. Next year we will set other objectives." Arrivabene insisted he needs to lower expectations. He aims to reduce the gap to the field-leading Mercedes and pick up the pieces if the Anglo-German team fails to deliver. "We need to lower expectations," he insists now. "For this year, we want to have our feet on the ground and our heads down and be there in the races when Mercedes has problems." Ferrari not only has to climb a big mountain if it intends to reduce the gap to Mercedes, but they also have to be careful with their engines. Mercedes still use their very first engine of the allocated four, while Ferrari already complete their third race with their second engine. The drivers of the Italian squad will most likely face a 10-place grid penality at the end of the season for a fifth engine, especially if they drop their second engine after three races in Canada in order to introduce a developed engine.